There are two stories in the Bible that have fascinated me all my life. The first is a parable that Jesus told. 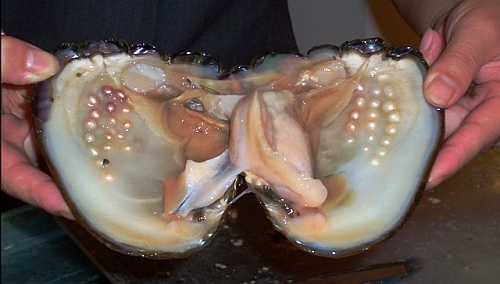 It is the story of a merchant who found an extremely valuable pearl. After finding this magnificent pearl, he went and sold everything he had to purchase it. I was always taught that the pearl was the kingdom for God and that when we find this great pearl, we must give up everything to purchase this great pearl. I wanted to be like that wise merchant and give everything to the Lord. Then many years later, during my prayer time, the Lord spoke to my heart in a still small voice and said, “Linda, you are that pearl and I gave up everything to purchase you.” During the past week, each time I think about Grace Renee, the Lord reminds me of the pearl of great price. Again, the Lord has spoken to me, “I’ve brought my magnificent pearl, Grace Renee, home. When Cindy, an ARC staff person, came into Special Gathering last Saturday, she pulled me aside. At first, I was hesitant to be drawn away from eye and ear contact of the group, even though there was another volunteer in the room. However, when it became apparent that something really bad had happened, we walked a distance away from the room and Cindy tearfully shared that “something is wrong with Renee.” She didn’t know what had happened but she felt that perhaps, as Renee’s pastor, I could find out. Small things about Renee were most endearing, like the quirky way she could sneak to get her way. You didn’t know whether to scold her or hug her. When one trick no longer worked, she would devise a different tactic to snare you into getting her way. Renee also reminded me of a second story from the Bible. This story is true. In the last week of Jesus’ life, a woman came and washed Jesus’ feet with her tears and wiped them dry with her hair. Because of the dry, dirty conditions in Judea; and because everyone wore sandals, it was a custom to wash everyone’s feet as they entered a home. But the host had neglected to do that for Jesus. When this woman washed Jesus’ feet, it was a blessing that she could uniquely give him. It was a splendid and deeply personal gift of love. I believe that Renee often showed her love for the Lord in deeply personal ways and that love spilled out onto us. Yes, we will miss Renee but mostly we will miss the times she washed away the concerns of the day with her antics and joy. We will miss the way she reached down and personally knew what we needed; and without a word, her touch and smile helped to meet that need. She was perhaps one of the weakest among us; but in so many ways, she was able to show us the Lord’s strength and power. “But the people who trust the Lord will become strong again. They will rise up as an eagle in the sky; they will run and not need rest; they will walk and not become tired.” Life is replaced with death. Death is replaced by eternal life.